Feels like a long time since I put together a new kit but I'm pleased to announce this little WiFi controlled strandbeest is going to be available at EMF camp this coming weekend and shortly after it'll be available online. 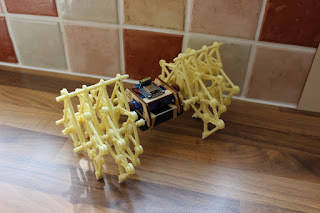 It's a mash up of the plastic strandbeest kits and my recent ESP8266 experiments so it can be driven from any mobile device. I had a spare day and an opportunity to go on a royal icing course so I thought it would be fun to try, plus another thing to learn about that compliments the rest of my cake stuff. 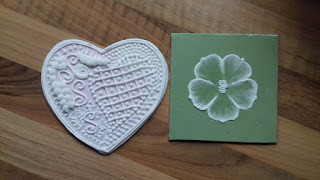 I learnt loads of interesting things about types of icing sugar and technique for piping icing, the brush effect on the flower is particularly effective. The bar itself for Vale also had to be portable to get it out into the middle of the quarry. This poses a bit of a challenge because it's a large item. The wooden crates I made are so sturdy that they could be sat on so they were an appropriate place to start. 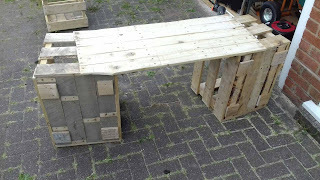 The top itself is just several pallet planks sanded and connected together with a few batons. The surface then bolts into the crates with 6mm screws and wingnuts to make it fast. The whole thing goes together quickly and it all still fits on the trolley. It's a little bit low but it's functional. I've been asking for pictures of the bar in situ but it doesn't appear anyone got one which is a shame. The whole 'setting up a bar in the middle of a warzone' thing got a bit serious almost immediately after we arrived (we were hoping for a little bit of time before anyone noticed us). It was good fun though, would definitely do it again.